Support iPhone 4/iPhone 4s, a variety of smart phones. mediAvatar Video Converter is probably one of the world's easiest all-in-one video converting programs,which is capable of converting normal HD and SD video into 3D video format.It's not only for converting videos, but also a video editing program. It lets you convert videos between all of the standard-definition video formats and high-definition (HD) video formats such as AVI, MP4, MPEG, WMV, DivX, FLV, H.264/AVC, H.264/MPEG-4 AVC, AVCHD, MKV, RM, MOV, XviD, etc. You can also copy audios from videos and convert them into any audio format without loss of quality. As video editing program it can cut, clip, merge video clips as well as add multiple video effects, watermarks, subtitles and soundtrack. In only a few steps it can also convert movies, TV shows and your favorite music videos into the required format for all portable devices. 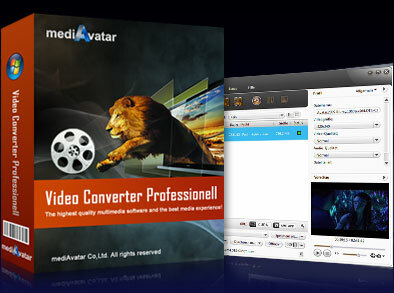 Download mediAvatar Video Converter for free now. It couldn't be easier! MediAvatar Video Converter Pro supports to convert standard video to 3D, and change the format of 3D video. Mutually transform among MP3, WMA, WAV, RA, M4A, AAC, AC3, MP2, OGG audios, or extract audio files from videos. To output a file with the exact file size, use the built-in Bitrate Calculator tool to customize the output file. Edit ID3 tag for MP3 and WMA files; preview videos and take snapshot; run the video conversion software in background.